“School can be a challenging time for some children, so ensuring they are as comfortable as possible is important for their physical and mental development,” says ACA President Dr Anthony Coxon. So what are you looking at with fitting a backpack correctly? 1. 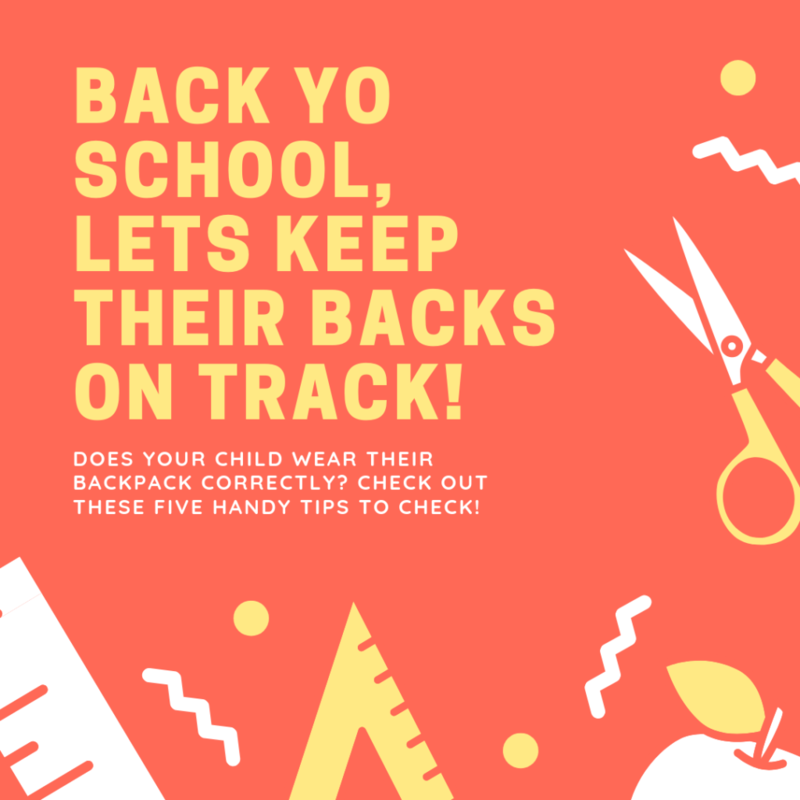 Make sure the backpack is the right size for your child, no wider than their chest and no lower than the hollow of their back. 2. A moulded frame on the back, that when adjusted fits their spine. 3. A bag made from a light weight material like canvas, with two padded straps. 4. Adjustable waist and sternum straps. 5. Separate compartments that allow for easy packing and weight distribution. 1. Ensure that the weight of the backpack is no more than 10% of your child’s weight when packed. Only pack essentials to lessen the load, perhaps use school lockers if available. 2. Pack the heaviest items closest to the spine and make sure all zippers are done up all the way. 3. Secure the sternum and waist straps (they’re there for a reason). 4. Always wear both straps, tell the kids it’s not cool to ‘one-strap it’ anymore. 5. Reduce the time spent wearing the backpack to no more than 30 minutes at any one time. The ‘Chiropak’ is a durable, functional and comfortable backpack, developed by Spartan School Supplies together with the Australian Chiropractors Association (ACA). Find out more about the Spartan ‘Chiropak’ by visiting the Spartan website. What else can we do to ensure our children’s spinal health? Good spinal care shouldn’t start and end with a backpack. Sitting with a good posture in school while learning and playing is just as important. Check out the ACA Sit Right page for tips on maintaining good posture throughout the day. Ensure your child is undertaking at least 60 minutes of moderate physical activity every day, as a part of correct spinal care. Whether it is a play in the park after school, or a weekend sport, physical activity is necessary for a healthy lifestyle. Developed by the ACA to help Australians of all ages practice good spinal health, the Straighten Up app can be used to set reminders and receive notifications about sitting right, stretching, improving posture and drinking water. This can be a great after school activity for both adults and children, or for older children to use throughout their day. We hope this helps! 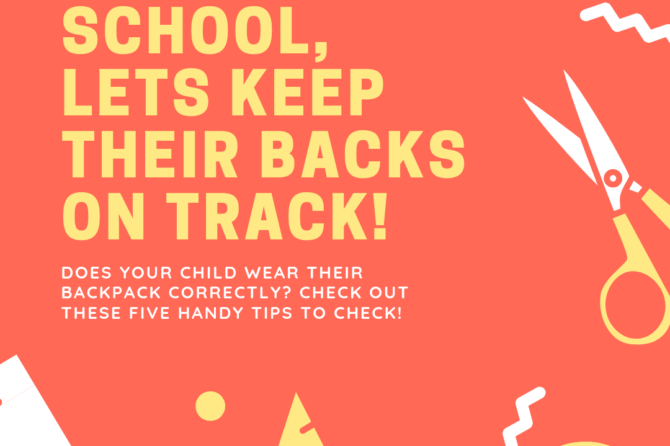 If you would like any more information make an appointment today with your chiropractor for more advice and assistance on selecting the right backpack, and to make sure it is fitted correctly to suit your child’s current level of development.